Sofi is our cocker, who we bought from a breeder when she was 3 months old. She is now almost 4 years old and has had to live with having another member in our family, our son Dali who is now 2 and a half. They get on splendidly, whenever we go for walks, she sticks by his side, always keeping an eye out for each of us (Master is there, Mistress is there, Dali is there..oops he's wandering off, I'll go see if there's any trouble). She's wonderfully sociable and has lots of patience, as her "brother" rides on her back and lays down in her bed and plays with her toys and she never gets angry nor growls. They play fetch together and act like brother and sister. Comments for Sofi And Her Younger "Brother" Dali. Sofi looks just like my Spencer! I swear if you put the two together you'd have a hard time telling them apart! She is so lovely, she even sits like Spencer - I think this must be a cocker trait as I've seen many cockers sitting with one of their back legs open and splayed slightly. Sorry, I'm rambling - I just had to post this to say how gorgeous I thought she was. How lovely is she? Sofi is beautiful and I love her harness. Typical though, most cockers need to wear a harness because they pull on the lead. Does Sofi pull on the lead, is that why she's wearing a harness? It's true, cocker spaniels are just big softies and I think Sofi proves that point. She sounds such a loving, caring dog and she's very lucky to have such a wonderful 'brother'! Sofi sits like our cocker spaniel, with her back leg slightly splayed outward - I think it must be a cocker thing. 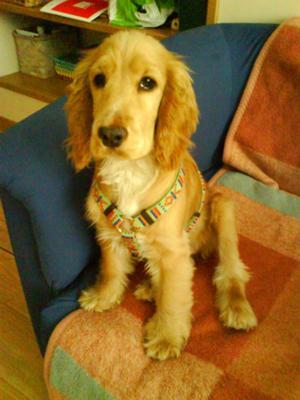 Anyway, just thought I'd let you know that I think Sofi is a lovely cocker spaniel.